Cain Velasquez was already soaring up the heavyweight ladder when two-time Olympic wrestler Daniel Cormier was getting his feet wet in the American Kickboxing Academy, attempting to get his own MMA career off the ground. So head coach Javier Mendez kept a close eye on the two when they were in the ring together. Cormier, a competitor from birth, wouldn’t have it. Nearly a decade later, Cormier and Velasquez are still friends, still training partners and still at different points in their careers. Velasquez, a two-time ruler of the heavyweight division, is plotting his comeback from injury at the age of 35. Cormier, 39, is the UFC’s champion at 205 pounds and closing in on a retirement that he expects to come next year. And in keeping with the theme that some things never change, as “DC” prepares for Saturday’s showdown with current heavyweight king Stipe Miocic, he’s still looking for those young kids to make him dig deep in the training room. This time around, it’s a familiar face in Duke All-American wresler Jacob Kasper. That type of training camp torture is par for the course with Cormier, one of the hardest workers in the sport. That willingness to go where few want to led him to the top of the wrestling world, and he’s repeated that feat in MMA. Yet even though his name is already etched in the history books, he still wants to add another chapter to his story before he hangs up the gloves, and to do that, it means taking care of what he considers to be unfinished business. That part saw him begin his career with a 13-0 slate compiled solely at heavyweight. And it wasn’t a stretch filled with cupcakes as he built his record. His friendship with Velasquez prompted him to drop to 205 pounds, and in his fourth bout in the division, he beat Anthony Johnson for the vacant light heavyweight crown. 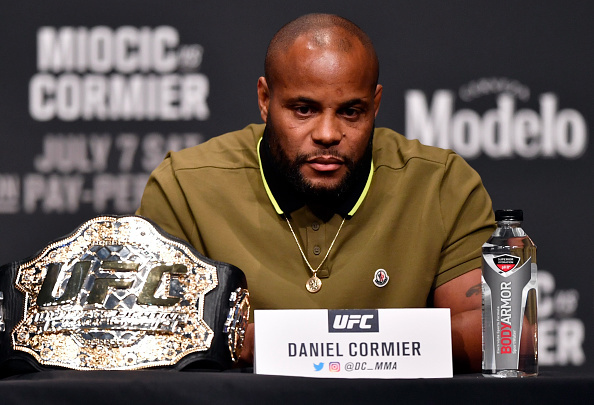 To this point, the only blemishes on his record are a loss and no contest with Jon Jones, and while the Louisiana native would love to close his career with another shot at redemption against Jones, for now, it’s all about Miocic, and if Cormier joins Conor McGregor by becoming only the second fighter in UFC history to hold two divisional titles simultaneously, it will go a long way in pushing those Jones bout into his rearview mirror. Win or lose, they already will. But if he beats Miocic, you might just want to start calling Cormier the baddest man on the planet. That’s cool with him, but he wants to go a step further should he leave T-Mobile Arena with two championship belts.